This is a really tough episode of Esoteric Observations for me to get my head around. I hope it makes sense. I installed my first Shimano Ultegra 8000 rear derailleur the other day. * It’s pretty unusual. The derailleur bolts to an adapter that Shimano calls a B-Link. The B-Link adapter bolts to the derailleur hanger. 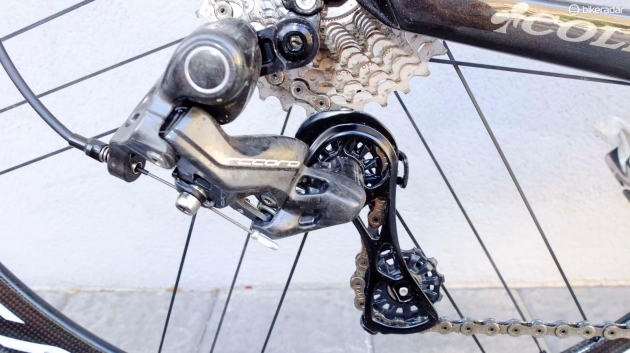 Shimano calls this a “Direct Mount” derailleur. It doesn’t look direct to me. It looks totally INDIRECT. Normal rear derailleurs are direct mount. They bolt directly to the hanger. What gives? 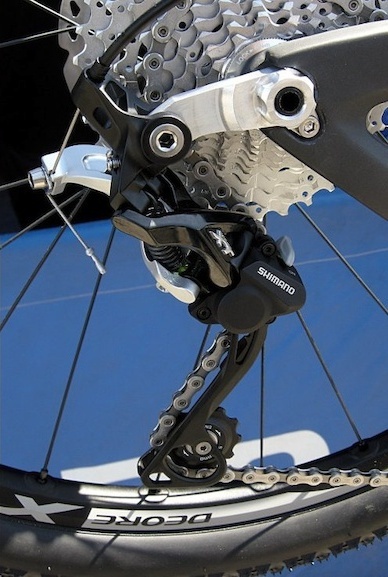 Shimano proposed a new rear derailleur hanger standard in 2012. They called it Direct Mount. At the time it was targeted to mountain bikes. Their specification positions the derailleur mounting bolt about an inch to the rear of where Campagnolo standardized it 60 years ago. Moving the pivot point back apparently improves shifting on “one by ten” and “one by eleven” gearing systems with those huge 40+ tooth cogs we see on mountain bikes. By the way, WolfTooth and a few other aftermarket brands market hanger adapters that locate the hanger mounting bolt back, allowing “regular” derailleurs to accommodate larger cogs as well. 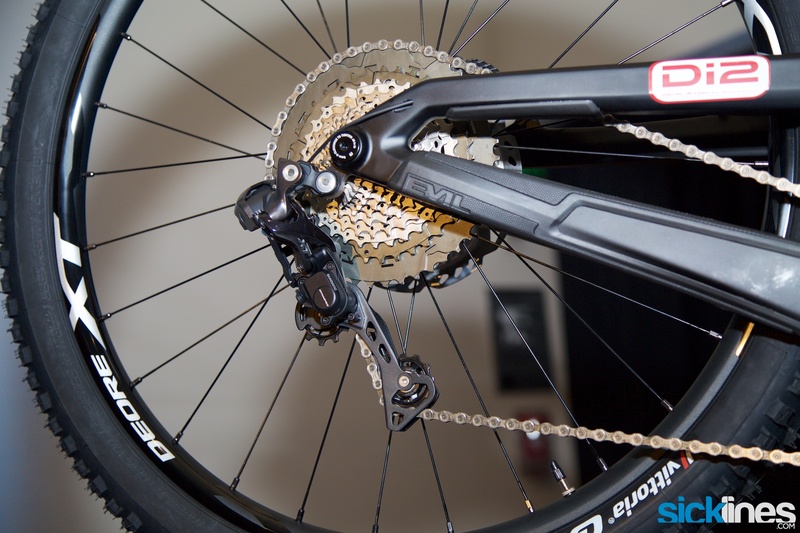 And many MTB manufacturers offer their frames with hangers positioned to the Shimano Direct Mount standard. 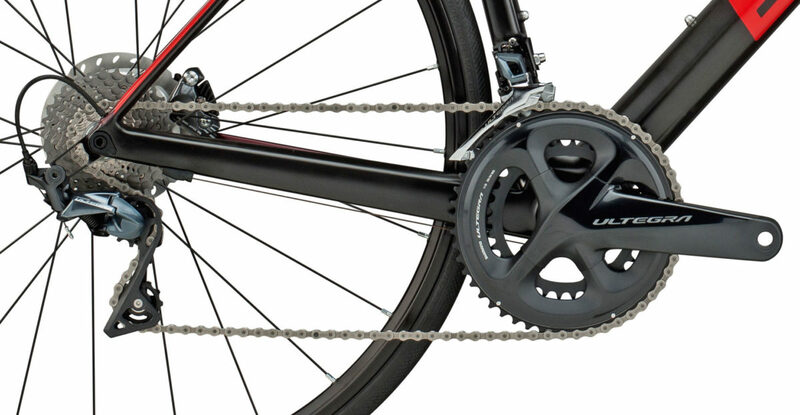 With aging bicycle consumers asking for larger cogs (lower gearing) on their road bikes, the 32 tooth capability of Shimano’s Ultegra 8000 (long cage version) is a good thing. If they have to move the pivot back an inch to do it, then I guess that is a good thing too. As far as I can tell, the only road bike currently available with a Direct Mount derailleur hanger is the BMC Team Machine. I came across this picture on BikeRumor.com. So it makes sense to ship the B-Link adapter with the derailleur, as Shimano does, to mate to an ordinary hanger. However, virtually all hangers are replaceable items, so it can’t be too hard for bike makers or wheelsmanufacturing or derailleurhanger.com to tool up and churn them out as a retrofit or a new build option. It gets weirder – Shimano was selling their low end Tourney derailleur in what is clearly a Direct Mount configuration before 2012. I see pictures on the internet from as far back as 2010 showing this design. It was mated to their then-labeled MegaRange wide range freewheel found on department store bikes. So is Direct Mount a case of trickle-up technology? I found this picture in a conversation on StackExchange. Check out the horizontal dropouts. Bonus points for identification of the bicycle. 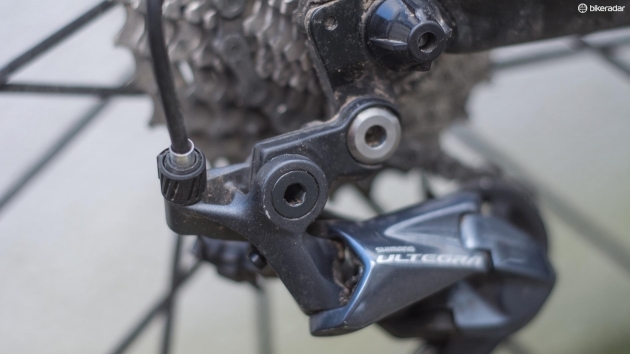 Anyway, Ultegra 8000 is only truly direct mount when mounted to a hanger manufactured to the “Shimano Direct Mount” specification – which hardly exists yet for road bikes! Saying it is stiffer and stronger, which they do, might be true when mated to a Direct Mount hanger. There is no way a Direct Mount derailleur … mounted to an adapter … mounted to a standard hanger … is stiffer and stronger**. Would you like thru-bolts or quick release with that bike? Stay with me. This is the confusing part. It all started with carbon fiber wheels. Rim brakes don’t work as well on carbon fiber, especially when wet, so we demanded disc brakes. Now that we have disc brakes, we need thru-bolt axles to withstand the off-center forces from the disc (and to ensure that the front wheel does not pull out of the fork). Hold that thought for a paragraph while I talk about derailleur hangers on quick release bikes. Quick release bikes – The normal interface between a replaceable derailleur hanger and a dropout is in a very crowded location on a quick release equipped bike. The thickness of the derailleur hanger and the thickness of the dropout are limited. But it doesn’t have to be this way. There is no reason other than tradition that the hanger must be clamped between the locknut and the dropout. If the right rear dropout had a horizontal extension to the rear of the axle, the dropout could remain full thickness, and a hanger with the mounting hole in the traditional location, or in the “Direct Mount” position, or anywhere in between, could be attached to it. This hanger could be made as strong or as weak as you like. Thru-bolt bikes – A thru-bolt dropout is not width-limited. Nor is it constrained by tradition. And they’re coming to road bikes, like it or not. A replaceable hanger, as thick as you like, can be thru-bolted to the outside of the dropout, providing the strength and stiffness necessary to support a hanger bolt location an extra inch and a half from the axle, just like on a mountain bike. In the meantime, Shimano is simply ahead of the game. 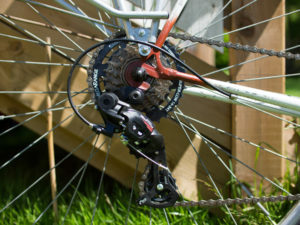 I just saw a picture of the new Campy 12-speed at www.BikeRadar.com. The rear derailleur is … you guessed it – Direct Mount! 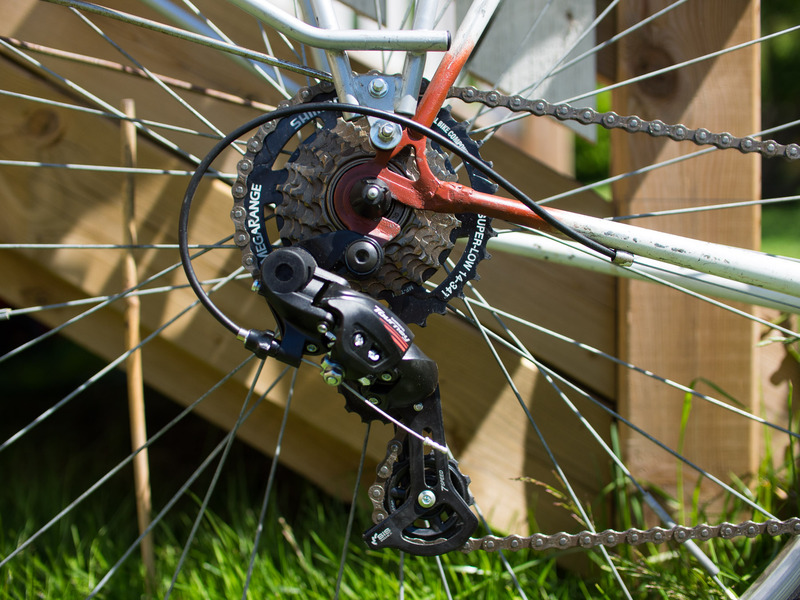 An advertised advantage of moving the derailleur pivot back – it makes rear wheel removal easier. But a thru-bolt axle makes rear wheel removal harder. This aspect looks like a wash to me. 1. The B-screw on the rear derailleur and the high and low limit screws on both derailleurs are 2mm hex bolts. I’m less than convinced of the wrench-worthiness of these miniscule bolts. 2. Referring to the overhead view of the Direct Mount hanger above, note that the derailleur attachment to the B-Link is a double shear pivot*** instead of a single shear pivot. Race car builders always prefer double shear pivot points in their steering and suspension designs because they are stronger and stiffer than single shear pivots. Shimano can double shear pivot the derailleur to a Direct Mount hanger because the inboard side of the hanger is not jammed in next to the cogs. If you’re having trouble sleeping, Google “Double Shear vs Single Shear” and read a few scholarly articles on the topic. *Thanks for the craft brews, BierMeister Mike! **Stiffness is not the end game. It’s just something you claim as a manufacturer. The real test is shifting performance. I find that the 8000 does that wonderfully. And strength? The hanger is supposed to be a weak link. That said, I’d like a hanger made of a material that is less subject to low-cycle fatigue than aluminum. Any ideas? I was thinking carbon fiber, but it needs to be bendable to adjust for a misaligned dropout. ***Thanks Dougie for pointing out to me the use of double shear pivots so many years ago. I never forgot. Just wanted say it was very nice meeting you and to thank you again for all the help over the weekend and for checking out my bike. It wasn’t making the noise is was on Sat so maybe just tighten up the skewer fixed it?? Mark, great meeting you too! Tightening the skewer doen’t always fix these noises but it’s so simple, I always do it first. Keep on Rolling! Well written, informative and interesting to read. Where I live, most mechanics call “direct mount” any RD that is attached to any frame hanger with a bolt. The other type “widely recognized” is a “hanger RD” – that comes with it’s own hanger (steel usually) that is bolted to the dropouts – usually on bikes with (semi)horizontal rear dropouts.